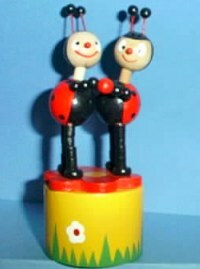 This cute couple of ladybirds or ladybugs are standing on a red daisy- shaped leaf. Great hand-painted facial expression and good push action. Copyright www.pushpuppet.com. All Rights Reserved. eCommerce Software by 3dcart.